My Mother and Father-In-Law on Their Wedding Day. I am beginning to realize what an amazing, happy, carefree, often-oblivious life I have lived. In three weeks, I will be thirty years old, and I have just, as of last week, had my first concentrated dose of suffering in the recent death of my father-in-law. Randy’s Father suffered for many years before they found out what was wrong. It was while we were dating that he was diagnosed with Huntington’s disease, a slowly-progressing genetic disease that attacks the nervous system. I knew just enough about this disease to be paralyzed with fear. Selfishly, I looked only at how the disease may affect me, my possilbe-future-husband, my possible-future-children, and I did not realize the magnitude of the suffering that Randy’s Dad had been called upon to bear. Randy’s parents were like one person. 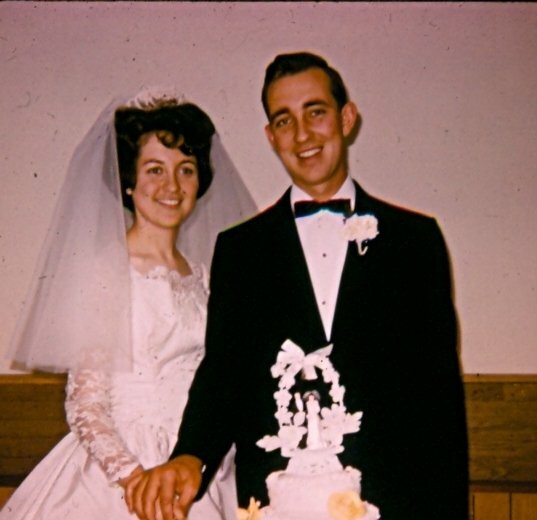 They loved each other deeply, raised a family together, built churches, saw miracles often. They lived by faith, walking through open doors, and allowing God to close doors behind them as they stepped into the unknown. They wanted nothing more than to do God’s will in each situation, great or small. They were beautiful, generous, loving people–often opening their homes to those who needed a place to live for extended times. They were always watching for ways they could actively share the gospel with others. They were overseas, in the states, traveling or staying wherever they felt the Lord was leading them. Their love for God was real and tangible, and it led them to listen and obey. When I met Randy, after the initial shock of my age, (I am 13 years younger than Randy), his parents instantly welcomed me into their family. They were used to God working in untraditional ways in their family, and they had enough faith to believe I might be the answer to prayer for their oldest son. Randy’s Dad often told me that I was his daughter, and I was never lacking love or acceptance in their home. When we got married, he prayed in the service, and I remember telling Randy that I was nervous he was going to pray we’d have a dozen children… He loved children, and his grandchildren were the delight of his last days. I am so glad that he got to meet our son Kells, who is now their youngest grandchild. The last time we were all together at their home, he spent some really sweet time reaching out and touching Kells, smiling at him, laughing. I feel that in some way, there is a connection between the two. Randall lived a very happy, contented life, even in the midst of losing, one-by-one, so many abilities/traits/characteristics of his former self. It was so gradual. Lentamente. It was 2o years of looking for joy in the struggle. In the same way a baby, one-by-one, gains a skill–now he can sit up, now he can eat food, now he can walk, now he can say Da-Da… In this way, Randall lost most of himself. By the end of his life, he and Kells were at almost synchronous stages in life. Both were struggling to sit up and to swallow food. Neither had the capabilities of recognizable speech. Both needed constant care and were tended-to lovingly. Huntington’s has the ability to reduce a person down to his essence or to reveal parts of a person that he tried to keep secret his whole life. This disease played itself out in Randall by exposing his sweetness, his heart to serve others, his quirky sense of humor, and above all, his unwavering love for God. Until the end, he was aware that life has an eternal purpose. Even on his deathbed, his godly life and influence was leading those around him to know his God. At the funeral, Randy’s Mother was radiant. I was sitting on the stage, so I was able to watch her through most of the service. She has been grieving and he had been suffering so gradually for so many years, it was bittersweet relief when he passed away. In her face, I could see the kind of love that transcends death. It was beautiful. Even in her sadness that he is really gone, she was glowing like a bride that will be reunited with her beloved in the end. There are some things that you shudder to think about passing on to your children. As extended family came through the Chester house, you could feel tension and fear at the thought of having to watch that process of death in someone else you love, or having to live through it yourself. It is a terrible way to go and a terrible way to lose someone. Medically, there is a 50/50 chance that a carrier can pass it down to his/her children. This real fear was tangible in the house as brothers and sisters, children, and grandchildren came through to comfort one another, some already diagnosed, some wondering… We have all wrestled with it. The wondering can eat you up alive. If you have it, there is nothing to be done but pray for grace and a cure and live out your life, one day at a time. But there are things that you can choose NOT to pass down to your children. There is no greater disease than fear, which has the ability to paralyze its victim for an entire lifetime. Fear will keep you from doing everything that is important in life. It will keep you from truly loving anyone or allowing anyone to love you back. Perfect love casts out all fear. Bitterness is also manifested as a spiritually genetic disease, which children learn from their parents and their parents before them. When we are unable to forgive (others, ourselves, God), we are passing bitterness down to our children. It is worse than any physical disease, and those who are diagnosed with it will never be able to recover (except by accepting true Love and Forgiveness, which is Christ) from any emotional hurt for the rest of their lives. It will build and build, until the person no longer remains. All that is left is the disease of bitterness. There is no spark of love or life left, only a lifetime of unresolved hurt. At the funeral, time and time again, those who spoke mentioned the legacy (or the mantle) that Randall had passed down to his children. He was never bitter, and he was never afraid. His spiritual genetics were beautiful–love, kindness, servanthood, faith, peace, patience, speaking purpose over the lives of his children. He was beautiful in life, and in death even more so. He died with such dignity and grace, even though his body functioned as the body of a small child. His spirit was sure, and it was beautiful to everyone who saw him in the last days/weeks/months/years of his life. I have seen this love and tenderness passed down into my own husband’s life, and I know that this is one of the things that made me want to spend the rest of my life with him. I pray that my own children receive this blessing, the spiritual genetics of a man who spent his entire life loving and serving others, thinking of eternal purposes in all things. Even in the midst of great suffering, he wore the mantle of peace, grace, and perfect love. My most sincere condolences go out to Randy, you, and the family. Just from reading the words you have written about him and what I know of Randy, this must have been an amazing man. One, whom I would have loved to have met. His love and kindness shine through in your post and I’m sure he will be missed, but never forgotten. You guys will be in my prayers.